In addition to its unique nature, Fell Lapland offers all the services necessary for a successful holiday: cross-country skiing trails, husky and reindeer safaris, snowmobile routes, freeriding, backcountry hiking routes, an abundance of bird and fishing waters, pleasant accommodation services and restaurants serving delicious meals. If you are after a holiday that offers more than just city sightseeing and nightclubs, Muonio is the place for you. 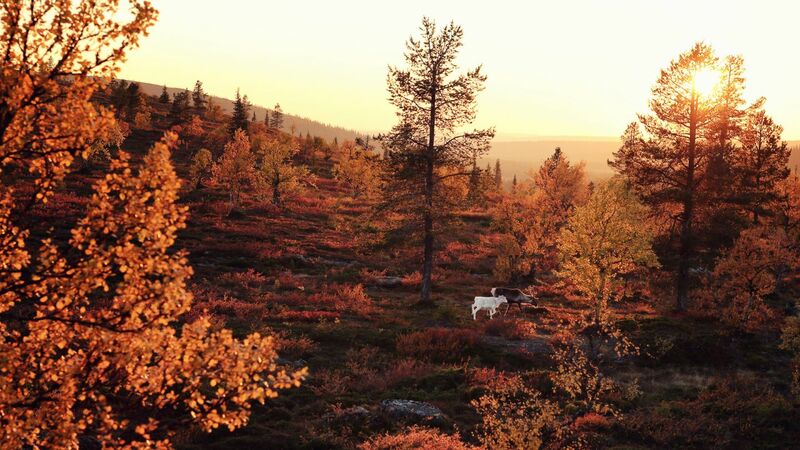 Lapland welcomes you to experience the land of mystique. Nestled among the gentle fells of western Lapland, Muonio is the perfect place for to spend your summer, winter or any time in between. Situated far above the Arctic Circle, the municipality has the longest snow season in all of Finland, a true winter wonderland. Whether it’s a snowmobile hunt for the Northern Lights or a trip to Harriniva’s reindeer farm at Torassieppi to learn about Santa‘s most important helpers, a winter holiday in Muonio creates unique and unforgettable experiences. Muonio is the perfect place to launch an adventure across the snow. 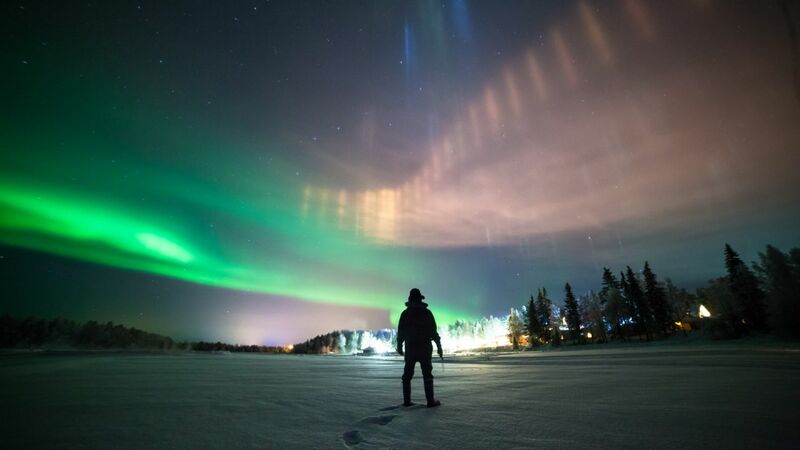 Strap snowshoes on your feet and go on an aurora hunting expedition. Drill a hole in the Muonio River and cast a line for grayling. Or just try to beat your own best time zipping around an ice kart track. If your winter holiday must have slopes and speed, Ski Resort Olos, about halfway between Muonio and the Pallas-Yllästunturi National Park, has ten slopes and four lifts. A great place to ski in peace, away from the crowds of the other ski resorts. Deeper into the fells, your chances for skiing grow exponentially. The tall, gentle fells are a paradise for backcountry riders and snow surfers, and Ski Resort Pallas offers nine slopes of natural snow. Finland’s most popular national park, Pallas-Yllästunturi, stretches from Enontekiö to the Ylläs ski villages, and it’s only a 20 minute drive from the comforts and conveniences of downtown Muonio. In winter, cross-country paths thread throughout the park, over 500 kilometers’ worth! When the snow melts, take a deep breath of the cleanest air in the world as you traverse the trails connecting the villages, visitor centers and resorts that dot the park and its environs. Take a break from the digital world and take a hike instead. 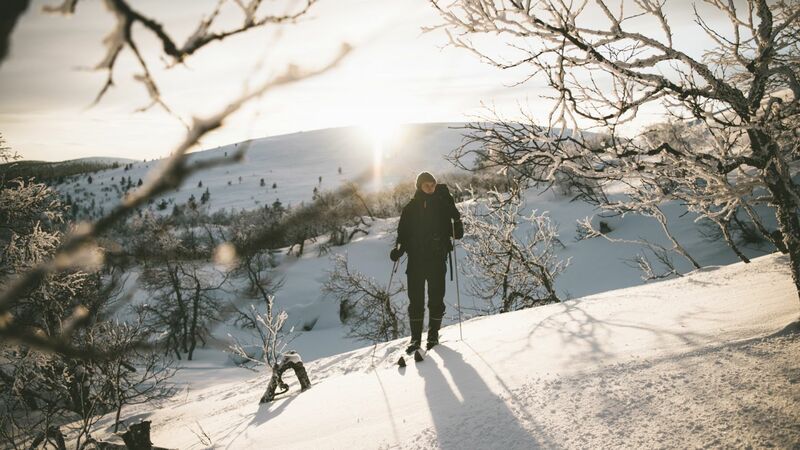 The popular Hetta-Pallas trail has been explored for the last 80 years and gives you four days to experience and absorb the Lapland wilderness. Water-lovers can enjoy swimming in the crisp waters of Lake Muoniojärvi or canoeing the Muonio River. Fishermen can spend their days on the banks of the Särkijärvi (Roach Lake) or take a boat across Lake Jerisjärvi and join the Shaman of Jerisjärvi by the fire in a kota. This lake is also popular for Finland’s national animal: seven swans even choose to say here all winter-long, even when the temperature drops to -30. You can see these hardy Arctic survivors from the road from Särkijärvi to Pallas. When the sun starts setting again (sometime in August), anyone and everyone can wander among the marshes, fields and forests to collect berries and mushrooms. Harriniva and Särkijärven Majat organizes guided trips to the best spots for blueberries, cloudberries, porcino mushrooms and more. 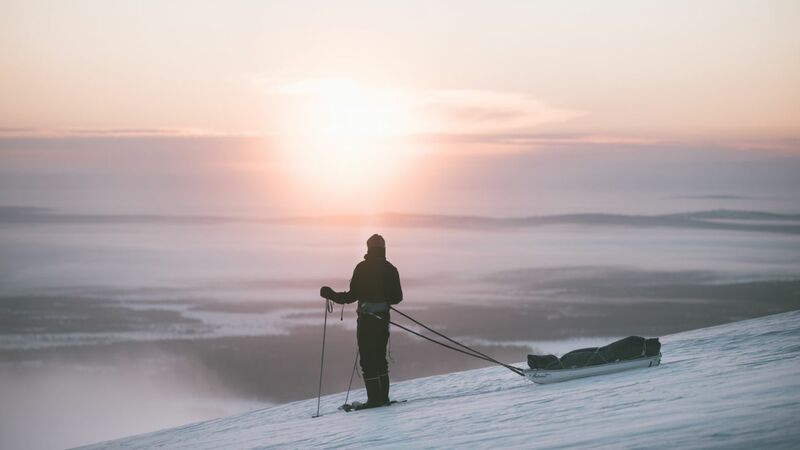 After a snowshoe trek across a frozen lake or a mountain bike ride to the top of Taivaskero, end your day with a genuine Lapland meal at the Harriniva Hotel Restaurant. Or you can keep your winter coat on and enjoy a hot dish at the Torassieppi Ice Restaurant, where the walls, ceiling, tables and benches are all made of ice and snow. The Arctic Spa on Lake Jerisjärvi is a great place to unwind and let the professionals massage your muscles and your spirits. Enjoy a traditional smoke sauna, and in winter, take a dip in the icy waters of the lake! It’s not an experience you’ll soon forget! When you ski or hike through Pallas-Yllästunturi Park, you’re welcome to spend your nights at the Open Wilderness Huts. Back in town, you’ll have to settle for the comforts and conveniences of world-class hotels, holiday villages and log cabins. Harriniva Hotels & Safaris offers large apartments for groups or families, as well as riverside cabins for fishermen, nature lovers, or those looking to get away from it all. Lapland Hotels has huge log cabins and luxury suites overlooking the fells. 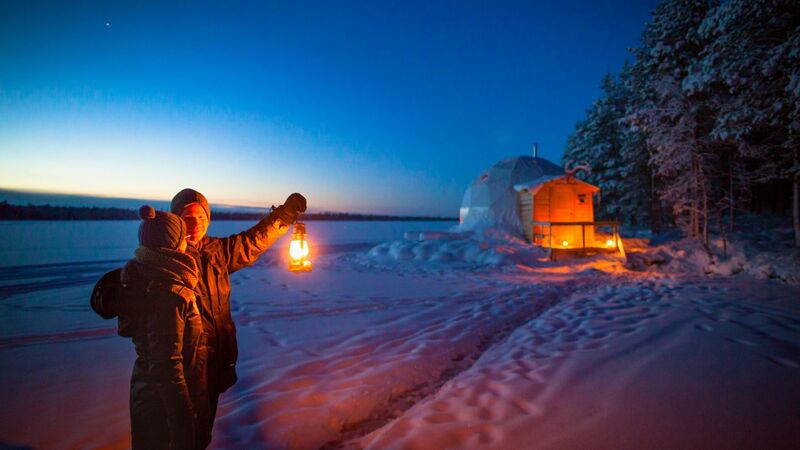 Those looking for a once-in-a-lifetime experience can spend their night in an aurora tent on Lake Torassieppi, watching in luxury as the Northern Lights swirl and whirl over the lake. The wild and beautiful nature of Muonio is home to many smaller holiday villages and log cabins. Muonio sits only about an hour from the Kittilä international airport, with daily bus and taxi connections. 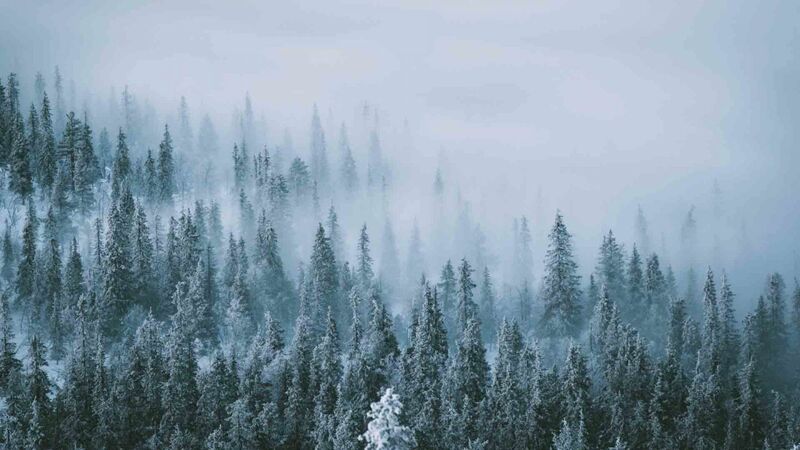 Or you can come via the international airport in Rovaniemi, the capital of Lapland, with multiple connections to worldwide destinations all year-round and daily buses to Muonio, Olos and Pallas. Those coming from the south can also come to Kolari by train (one hour away) and continue by bus or taxi. Muonio lies on Highway E8, which stretches from Turku (1000 km) in southern Finland to Kilpisjärvi (200 km) in northwesternmost Lapland. Route 79 from Rovaniemi cuts through the national park, offering photogenic views all year round, and connects all three villages. Sweden lies just across the Tornio River to the west, and if you travel north beyond Kilpisjärvi, you can visit the Scandinavian Mountains in Norway or even the Arctic Ocean. However you come to Muonio-Olos-Pallas, whenever you come, you’ll find pure wilderness, genuine Lapland culture and customs, and friendly faces. 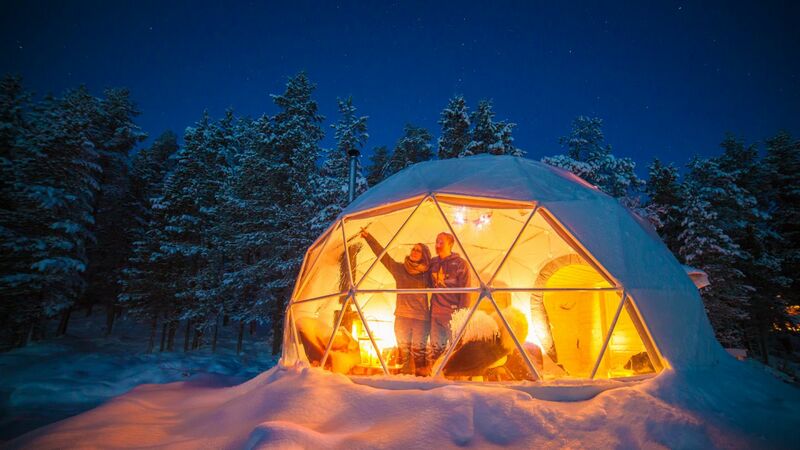 Welcome to the heart of Fell Lapland!